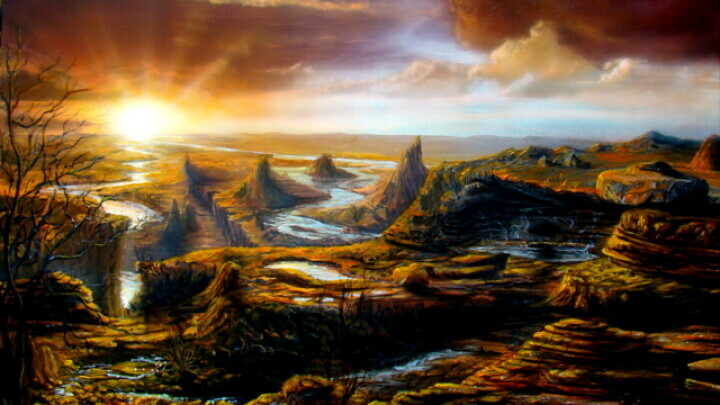 When he’s not painting cars, motorcycles, helmets, signs and more, 27-year-old local air brush artist Luke Johnson covers canvases with fantastic landscapes. Some might call it fate. Others may say “right place, right time.” Regardless, the simple act of Luke Johnson cleaning out his high school art room closet proved life-altering, as he discovered an old air compressor and set the course for his professional and creative life. After nearly a decade, Luke Johnson is now a professional airbrush artist doing custom works through his business Automotive Tattoos (on Eau Claire’s Starr Avenue) and occasional gallery exhibitions. But back in high school, shortly after graduating, this new infatuation inspired Johnson to go to an airbrush seminar in Las Vegas. With the exception of that seminar, Johnson is completely self-taught. 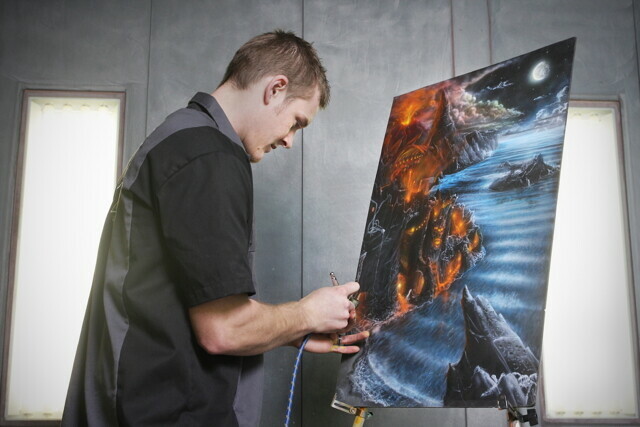 At age 21, Johnson moved to Arizona after being offered a job at Mike Loves Custom Paint Shop. Johnson worked there for about four years, until the market began to falter, and he decided to move back to Wisconsin to start his own business, Automotive Tattoos. Currently Johnson partners with United Auto Body as their freelance custom painter. There are few things Johnson can’t paint. Aside from cars, motorcycles, and helmets, Johnson has also done extensive murals, signs, and even mailboxes.